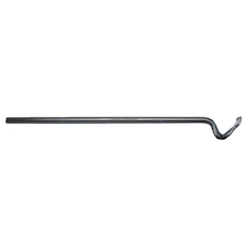 Swan Neck Leverage Bar Length 30" Ken Tool T41 / BOWES KT T41. These lightweight, portable tools are a great alternative to handled bead breaking wedges or hydraulic bead breakers. One end is used to remove frozen or rusted beads from all types of rims. On the T52, the other end can be used as a leverage bar when inserted into the 35695 or 35697 Truck Lug Wrench.